So on the 28th I posted a short blog post with no photos and it got 30 visitors and 38 views, but I post a lengthy post yesterday with 3 pretty good pictures and it only gets 9 visitors and 11 views. 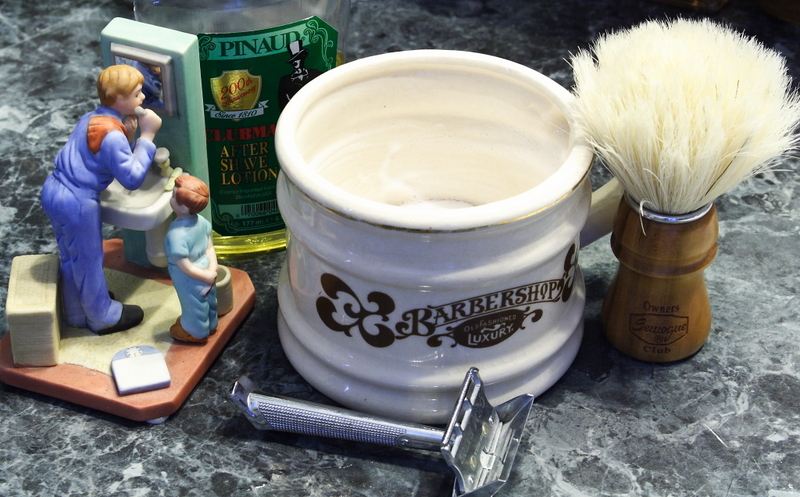 It seems I get more views from the fine shaving brethren on Facebook if I post my blog around noon and a little after which is what I think I had done with the no photo post. Anyway. ARKO!…a r k o… The slightly lemony soap scented soap that others say smells like a urinal cake. I don’t get it. To my nose it isn’t much different than Williams Mug Soap except it lathers much easier. A couple years ago I did the Arko August challenge and did just fine. I actually had come in late so I shaved twice just to catch up with the right number of days. So this month I will attempt to do it again. Shoot, maybe I’ll be able to use it all up. I’m not going to be frugal about it like I normally am with my soaps. I want to clear some space so I can try some other scents down the road. Seth Sparks is the recipient of my Jumble July PIF. I will be sending out to him Shaving Yeti’s Yeti Snot and Dr. Yeti’s Magic Elixir and a nearly full puck of Green Mountain Soaps Lime/Vetiver. Maybe some balm and Cremo will be thrown in. You just never know. For the shave today I went with the SOC because of it’s wooden handle. I’m always a bit nervous about using a handle that may chip or scratch, so this month might be wooden, unpainted handles only. This SOC has a different feel from my Semogue 830 on my face and covers more area. Holds a lot of water too. I am loving it. I loaded the same Treet Super carbon steel blade I have been testing into the Gem G-bar and got a really smooth shave. It was so smooth it actually felt like a DE blade. I was not expecting this and I did 4 complete passes while chatting with my wife and had no skin issues. Was my shower before hand to blame or was it a really good lather? Yes, I took my shower first this morning to help myself wake up. Used some alum and hot water to rinse and the Clubman had nearly no sting to it. I don’t see how the shower helped as it only took me 5 minutes to shower. Surely that isn’t enough time to do anything to my beard hairs.